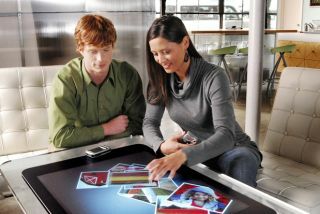 Microsoft has announced today at CeBIT the expanded commercial availability of its Surface machines. Up until now Microsoft Surface, the computing platform that responds to natural hand gestures and the like, has only been available to purchase from the US and Canada. Now it is being made available to buy in 12 markets in Europe, Middle East and Africa (EMEA), including France, Germany, United Arab Emirates and the UK. As with the Surface machines available from the US and Canada, the devices are still only available for commercial businesses. "Since our initial launch of Microsoft Surface, we've received an overwhelming response from companies worldwide that are looking for innovative ways to engage with their customers and developers who want to create applications that were not possible with other technologies," said Panos Panay, general manager of Microsoft Surface. "We're excited to be entering into these new markets with partners that have already begun exploring many possibilities of Microsoft Surface locally." Pricing is currently only available in Euros and will cost €11,000 (£10,000) for a standard machine. If you fork out an extra €2,000 (£1,700) you can buy a developer unit – which allows partners with SDK to modify the Surface with their own software.